Welcome to GeauxPass - Louisiana's statewide toll system! With GeauxPass you can drive on Louisiana toll roads and enjoy non-stop driving without stopping to pay tolls. There is no better time to get a GeauxPass, since the LA 1 Expressway is open. With GeauxPass, driving is worry-free on your way to Grand Isle or Port Fourchon. In order to allow greater flexibility and enhanced convenience for LA 1 toll payments, a toll booth was installed at the expressway in Summer 2013. Our toll collector can accept various forms of payment - cash (exact change is not necessary), credit cards, and debit cards - giving customers the ability to pay the toll in a way that is most suitable to them. The toll booth can be accessed from the right-hand lane of LA1. The left lane will remain a dedicated lane for GeauxPass customers, so they may drive uninterrupted through the tolling area. 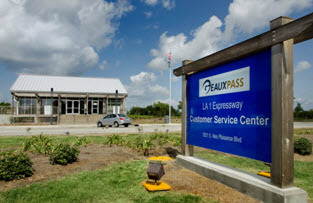 Preexisting GeauxPass account holders may continue paying tolls using their online accounts or stopping by the Golden Meadow Customer Service Center; however, single trip purchases will no longer be an option and all kiosks have been disabled. and require Adobe Reader. Download here.